Is This My Last Post? I thought I'd pop in here & let you know, if you haven't already heard, that the Government is planning a take-over of the Internet on Feb. 26th. We'll be taxed.....need I say more? One million signatures are needed to help stop this grab, or so we're told. So, if that happens, I will not be posting more than likely & need I say, if you have a blog, you won't be posting, commenting, etc. either. Freedom of Speech, Creativity, Small business', etc. will be hindered! We Americans are in the dark & I'm sure it's on purpose, about what is going to be done. I'm not sure where the Health Care Issue is, only that now after paying through the nose for Insurance; no one paying our bill for us, no one helping us, but us paying for our own insurance, we can no longer afford to use it! Prescriptions are too expensive to buy now too. The treatment the doctor wants me to have for osteoporosis, we can't afford to get! We are truly in God's hands now. These Scriptures tell us that Jesus, our Savior not only was wounded & bruised, & took our sin upon himself, putting himself in our place as our sacrifice that we might be made holy before the Heavenly Father, but that by the very stripes he took for us, he gave us HEALING! That WHATEVER we ask of him, BECAUSE we keep his commandments, living holy before him, doing those things that please HIM, WHATEVER we ask, we receive! Jesus is THE GREAT PHYSICIAN!!! things that doctor's couldn't heal. 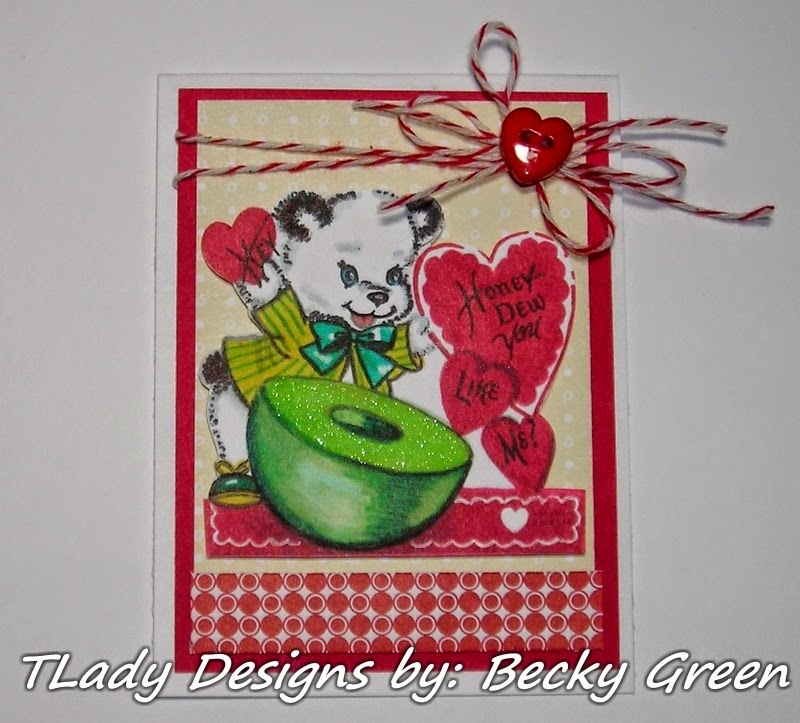 Valentines Day is coming & I thought you might like to see a Valentines Card! Made with a fabulous image Sharon & Chris sent me from Red Lead, along with my order. & topped off the Honey Dew with Wink of Stella! I popped him up on Scotch Perm. Mounting Tape. The button I used is one I've had in my stash, but Red Lead carries those too! 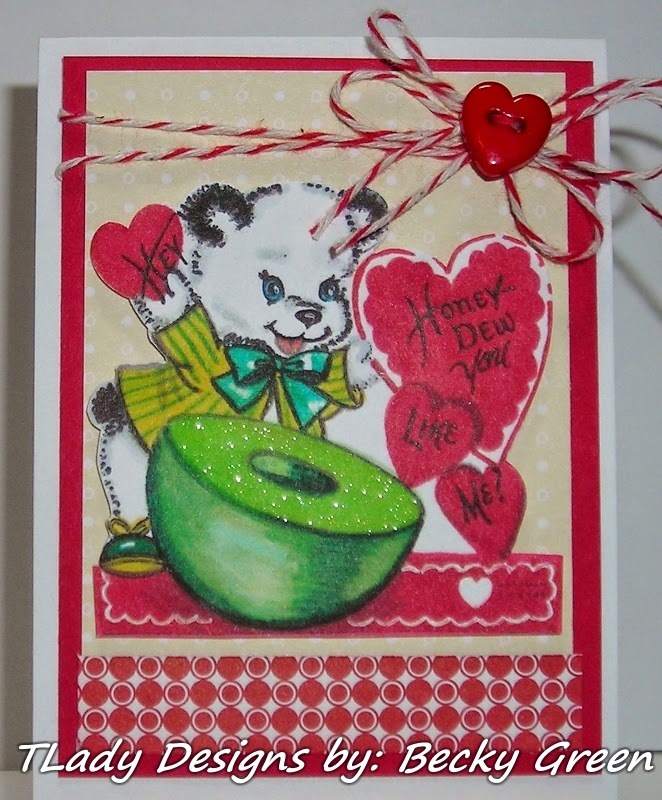 I used SU Designer Papers from a Valentines past. A little Baker's Twine from Amazon. (This isn't the Baker's Twine made for card making, but for baking! This is the inside sentiment. 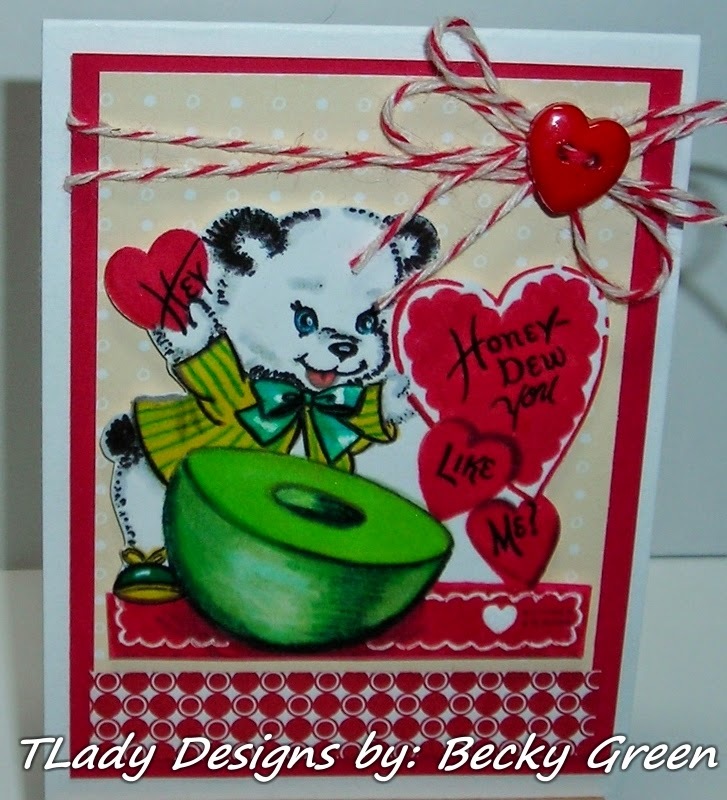 This is Red Lead-Valentine-"Pretty Please won't you give a sign." The heart is SU-Heart to Heart. 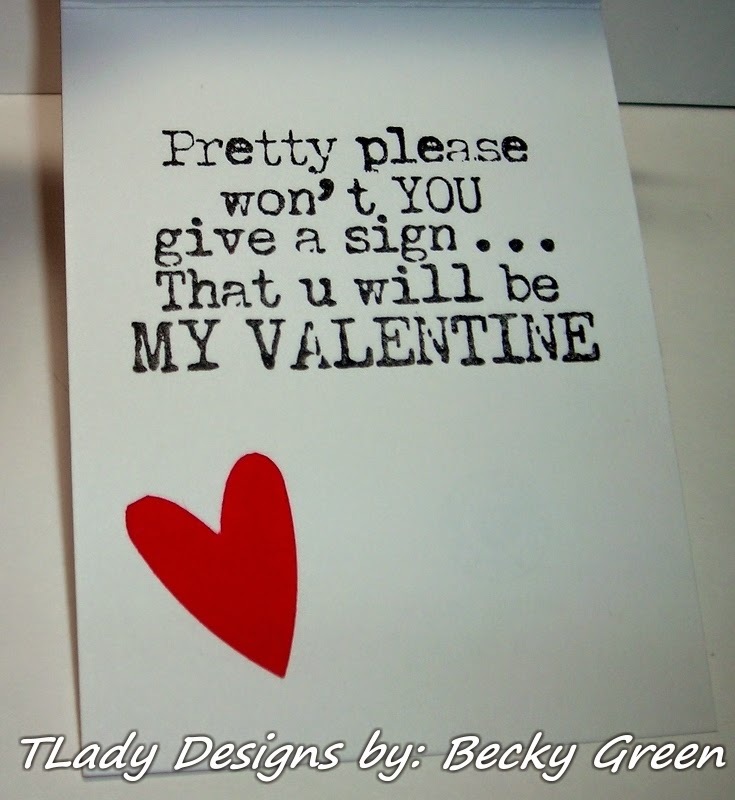 I ADORE these traditional Valentines Sentiments! 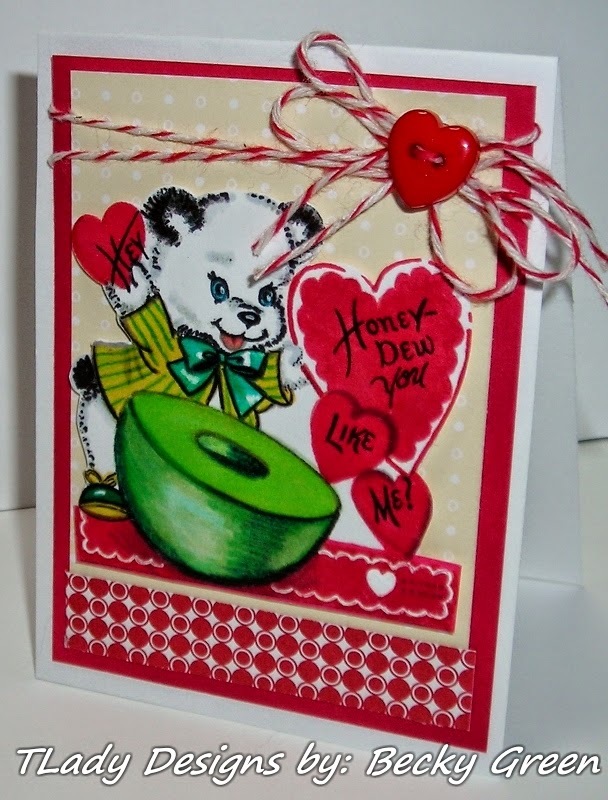 This is my kind of Valentine---Retro, little & sweet! Be sure to check out Red Lead!!!! They have more than Vintage Valentines. Are you dreaming of Chocolates, Valentines & Roses for Valentines? Just remember, there is one who loves us deeply, wholly & forever! 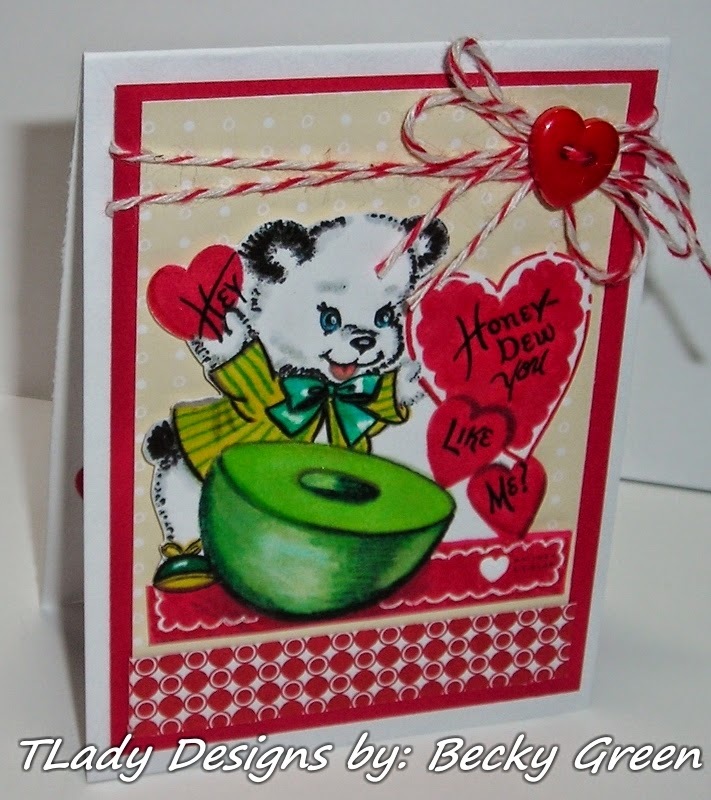 I thought IF this is my last post, what better way to end this blog, but with a Valentine!